In beginning a memoir project, I decided to dig through my old journals just to get a feel for what fifteen year old me was thinking. Holy cow, I think I should have just closed it up and left it be. Teenaged angst, early views on relationships and the all-important she likes him-he likes someone else drama happening. I didn’t remember writing any of the events that transpired in those pages, but I remember the feelings. The awkwardness. The shyness. The melodramatic events of school dances and hockey games; movie nights and trips to the record store; history classes and failed math tests. How much I missed my Dad. I skipped ahead to my second year of college to compare. It seems I grew up a bit in that time. The theatrical expressions were lessened and I spoke more of the transition of becoming my own person from that of a little girl in a confusing world. I loved living in the city. I loved working with the kids in residential treatment. I loved feeling necessary, intelligent and valued. I grew in college. I grew from a little girl writing down her daily activities to a young woman experiencing a life independent of parent, familiarity and routine. My entries were less frequent as I moved through classes and newfound friendships; downtown escapades and girl retreats up to northern Ontario. As I read through my second year the absence of the mention of my brother’s death was surprising. Not a word about one of the most traumatic events of my young life was there. The glaringly obvious absence of such an event should not have been a surprise. I must have thought I had outgrown the use of a journal and had no need to write such drama down on pages. I must have been so overwhelmed with emotion, I couldn’t bring myself to record it at all. I wish I had. I wish I would have written every last detail of it. The shattering phone call. The train ride home. The days leading up to the funeral. The Thanksgiving dinner where we laughed until we cried. The devastation of watching my brother grow from an impulsive angry child to a more mature independent young man with his own apartment and a girlfriend, then having it all taken away in an instant. His life was moving forward in a more positive adult direction. We were all breathing sighs of relief. And then it changed. It could have been cathartic. I remember thinking as I walked away from those difficult days with my mother and my family and boarded the train back to school that I was returning a different person. I remember thinking I wasn’t the same after his death. I had changed somehow. I had grown. I have been journal writing these past few months on a more regular basis. It may not be filled with all of the drama and angst of my teenaged years, but I find it soothing to write my thoughts on paper. It may not be cathartic nor reveal a secret hidden meaning of life, but it certainly gives me perspective on my life now and my life then. Perspectives on my changing world as my children grow from kids to adults, embarking on their own journeys and new discoveries; and how I continue to fit in to their ever-evolving lives. Apparently, my main reason for living right now is dinner prep and food organization. With all of life’s changes, it’s nice to take a look at where we were and where we strive to be. 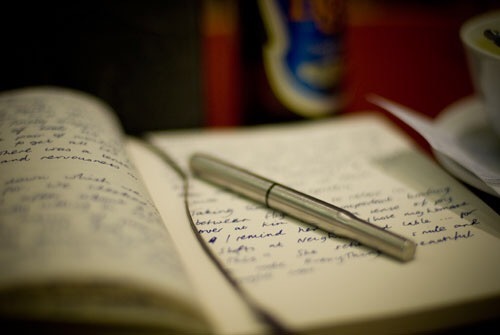 Maybe keeping a journal is another way of taking stock and reflecting on the journey. If you are a journal writer, take a look back occasionally to see where you were. You may be surprised at how far you’ve come.